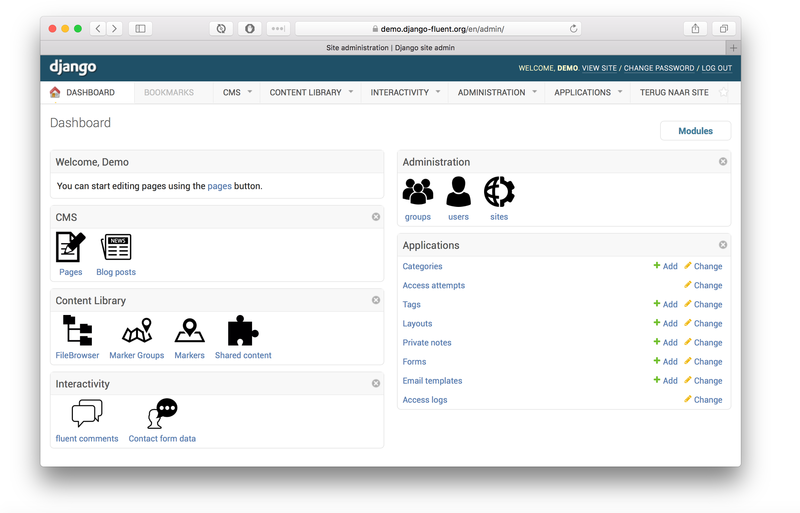 The fluent_dashboard module offers a custom admin dashboard, built on top of django-admin-tools (code). a “icon list” module for the admin homepage. a “welcome” module for the admin homepage. a configurable module layout for the admin homepage, through settings.py. a “return to site” link. The dashboard uses flat icons, which are available from http://www.flaticon.com/ and require attribution. Previously, the dashboard uses the “Oxygen” icon theme, which is freely available from KDE. You may use the icons under the LGPL 3 license. To use a different icon theme (e.g. Tango), see the FLUENT_DASHBOARD_ICON_THEME setting in the Configuration section. The Oxygen icon theme can be downloaded from: http://download.kde.org/stable/4.10.0/src/oxygen-icons-4.10.0.tar.xz. © Copyright 2011-2013, Edoburu. Revision fb223e03.